In light of the Adrian Peterson verdict, I am pretty fired up this morning. Stay tuned for a few thoughts on the NFL and what this guy thinks about the AP and the Ray Rice situation. As usual there are more questions than answers as we enter playoff season. Sure there are a couple of weeks left but there is no doubt that many of us are thinking about our road to the championship. All year long I preached trust in your starters and don’t worry about matchups, just let the good players play. Well that playbook is getting ready to head out the window as real team start to think about real playoffs. Time to guess who is going to play and who is going to rest. Let’s not waste any more time on this. Brian Hoyer, Cleveland Browns- No one wants to admit it but the Browns are pretty good. Everyone predicted that Johnny Football was going to be running this team by the end of the year and look at what has happened. Hoyer is a top 20 QB who is a lock for 13pts each week. The running game seems to be working itself out and the Josh Gordon’s return is looming on the horizon. These guys could be fighting for a playoff spot all the way to the end which means there could be a lot of value in Hoyer. 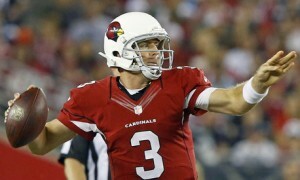 Drew Stanton, Arizona Cardinals– Another team that is better than people had expected. Yes, we knew the Cardinals were tough but we didn’t expect them to be in the “best team in the NFL” discussion. At least not a serious part of it. 2 touchdowns and over 300 yards taking over for the injured Palmer. Stanton is going to get you the same 13pts each week you will see with Hoyer but he is going to have more opportunities to blow up the score board with the weapons he has at his disposal. Also that Cardinal defense is going to keep the ball in Stanton’s hands. This might be the one team that doesn’t need to ride Stanton too hard to finish the season, however they may have him play the whole way just to get the reps. Either way he is going to get you something. And no I am not worried about him in Seattle. Kyle Orton, Buffalo Bills– Here I am looking at quantity over quality. Orton loves to throw the ball and has proven time and time again that he can rack up the yardage through the air. It looks as though Fred Jackson is finally going to make is way back. That will free up some pressure from the rest of the offense to have Jackson catching passes out of the backfield. Yes he did go without a score against a tough Miami defense and he is questionable to start. I still think Orton has a lot left in his tank this season and we will that against the Jets on Sunday. Isaiah Crowell, Cleveland Browns- Here is this week’s HOT free agent pick-up. Crowell was already going to be on this list, but the release of Ben Tate earlier this morning puts the spot light on Crowell. Everyone is looking at Gordon to make a huge impact and that is really good for the Browns running game. I would keep my eye on West as he will get some of the carries but right now Crowell is firmly in the driver’s seat. The Browns are going to be fighting to stay near the top of the tough division, Crowell might be the blue light special that brings home the gold. Jonus Gray, New England Patriots- This is probably the name on the top of everyone list. He appears to be the lead back in New England which means he should be picked up, there is no doubt about that. He has not shown the consistency we would expect from a #1 back on a top team but he is a threat all the time. Running for 199 yards and 4 TD’s is going to get everyone’s attention. Those who started him last week probably walked away a winner. Maybe you get lucky and history repeats itself. Tre Mason, St. Louis Rams– Mason has been the lead back in Stl. for several weeks now but his impact has not always been a huge one. However I am wondering if his 113 yards against a good Bronco’s team is the spark that will ignite a fantasy inferno. Like everywhere else, if you are the lead back you are going to get the carries which leads to the scoring and yardage opportunities. I guess the Chargers get to find out if he is the real deal. Personally I don’t think you can go wrong with Mason this week. Alfred Blue, Houston Texans- I guess there is extra room on the list this week or maybe I just don’t want to leave any man behind. Foster was out and Blue finally did what owners had hoped he would do earlier in the season, BE PRODUCTIVE! I am not sure of Fosters status this week, I know they want him back. However, in the event he is unable to go I would take a shot on Blue. The Texans have a decent offense and like to balance their attack. Without Foster, Blue is a big part of that. Jordan Matthews, Philadelphia Eagles– There are only two things for certain in this life, death and taxes. Well I think that it is time to add Matthews to that list. 4 TD’s in 3 weeks to go along with 15 catches for 285 yards, those are Maclin type numbers. It is hard to find much consistency in Chip Kelly’s offense but Matthews seems to have found himself a niche. He might be one of the hottest receiver pickups this season. Kenny Britt, St. Louis Rams-With Quick down someone has to step up and fill the void. Britt did that this week after he was on the receiving end of 4 passes from Hill including a TD. He only gets targeted a few times each week but he is making the most out of his targets averaging over 10 yards per catch in the last 4 games. Knee injuries slowed what looked to be a hall of fame career but that doesn’t mean he doesn’t have something left in the tank. There are no guarantees here, but Britt could capture some of that magic he had a few years ago in Tennessee. If he does he will help you out. John Brown, Arizona Cardinals- Statistically Brown is the 2nd best receiver on this team behind Larry Fitzgerald. In fact he is 2nd in all categories except for TD’s where he is 1st. Not a whole lot of secrets here, the guy gets targets and he finds the end zone. He has breakaway speed and will see a lot of single coverage as teams have to account for Fitzgerald and Michael Floyd. This rookie might be a guy to target if you are in a keeper league. Coby Fleener, Indianapolis Colts– The Colts took a whooping at the hands of Tom Brady and Patriots this week losing Bradshaw and possibly Dwayne Allen in the process. I guess you could call this a case of addition by subtraction. The loss of 2 key recievers brings Fleener to the front of the line. Fleener has put together a few good weeks and this could be the breakout opportunity he needs. As much as I would like to see Richardson value increase this week my money is on Fleener. The loss of Bradshaw means more passing and the door is open to Fleener. Coming off 7 catches for 177 yards, this could be someone to get excited about. Heath Miller, Pittsburgh Steelers- No it isn’t grandparent’s day. Miller has proven once again that he has a little life left in his old body. I don’t even know how old he is but he has been around a while. Big Ben is still throwing a lot and Mille is quietly bringing in what he can. TE is a very shallow position and Miller isn’t a threat to get huge points but he might just get you the few points you need to come out on top. Mychal Rivera, Oakland Raiders- I should just direct you to my blog from last week. Rovera took a little step back totaling 4 pts on only 40 yards but that shoudn’t scare you too bad since that is 2 more points than Jimmy Graham. Rivera isn’t Graham but he is a good TE who is allowed to have a down week. The upside here is that GM’s who scooped him up last week might have dropped him in their disappointment. Now is a good time to grab this guy, he is going to score in bunches the rest of the way.